I love hydrangeas! They are the most perfect looking flower in your garden at this time of year on the West Coast. I am NOT a gardener at all…I’m lucky that Jason is! When planning our landscaping our words to the landscape designer were…”English type garden with lots of flowers and not too much maintenance”. Well, we have a lot of flowers…as for the maintenance…well, talk to Jason! But I will say that hydrangeas are relatively low maintenance and their blooms are fabulous right now! 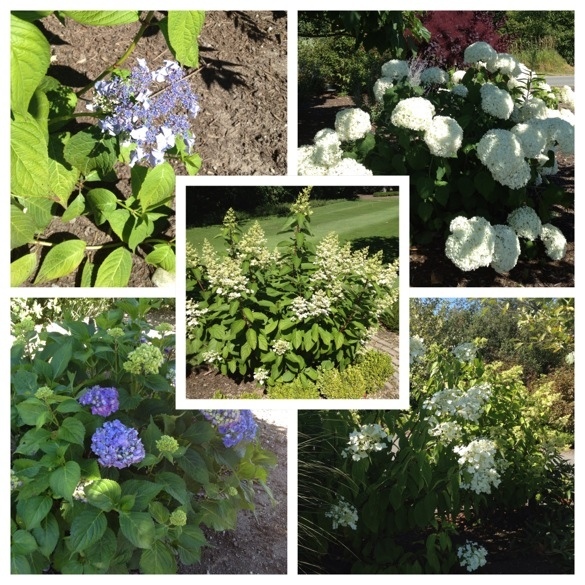 Walking around my yard on the weekend, I realized that we have at least 5 varieties of hydrangeas. The cone type hydrangeas in the center are not quite blooming. They will be good to go in a week or so. They line both sides of our driveway and look quite stunning when they are in full bloom. Some look like snowballs, others like lace. The same variety can range in color from blue to purple to pink depending on the acidity of the soil and the amount of sunlight or shade that the plant receives. 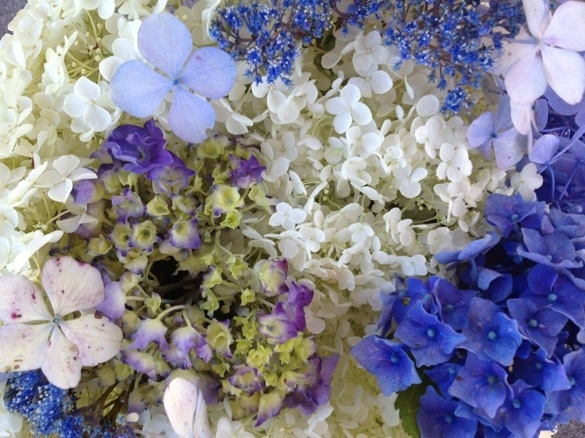 The more acidic the soil, the bluer the blooms will be. If the soil is neutral, the blooms will be pink. Also, the blooms can burn if they plants are in full sunlight. For more information, click here. 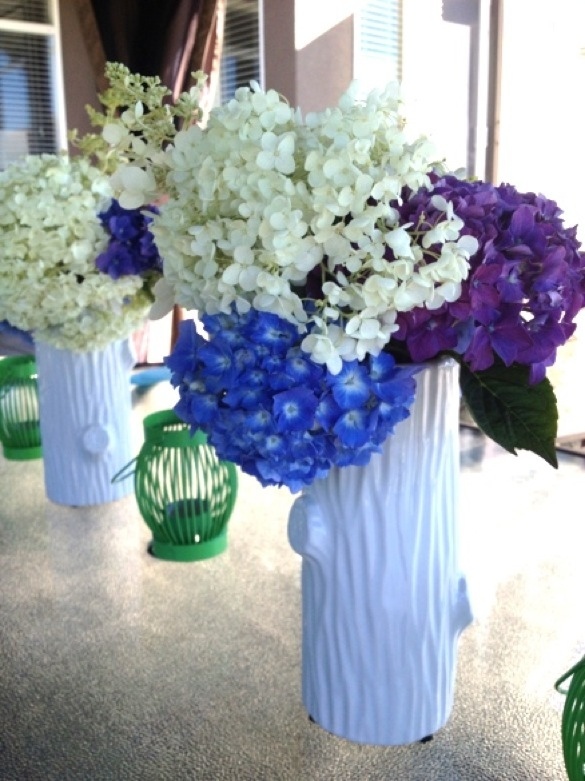 I am by no means a florist, but I do love clipping hydrangeas and arranging them in vases. They have almost an antique quality and don’t require much “arranging”. I just purchased these faux white wood vases from Real Canadian Superstore for $5 each! 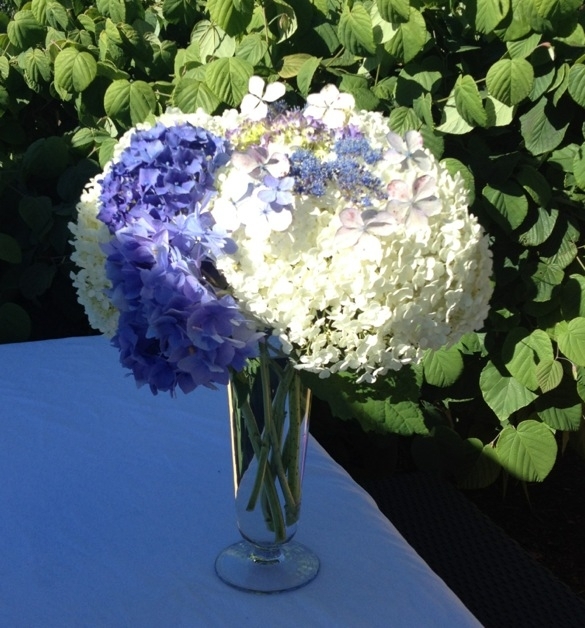 You really can’t go wrong with hydrangeas. No arranging experience necessary! 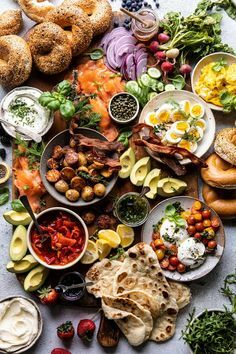 These arrangements were perfect for a casual summer BBQ on the weekend. They really didn’t cost anything, except the $10 spent on new vases that I can’t wait to use throughout the fall!